It's time for another Friday Mashup and this week Tara has a fun challenge for us! 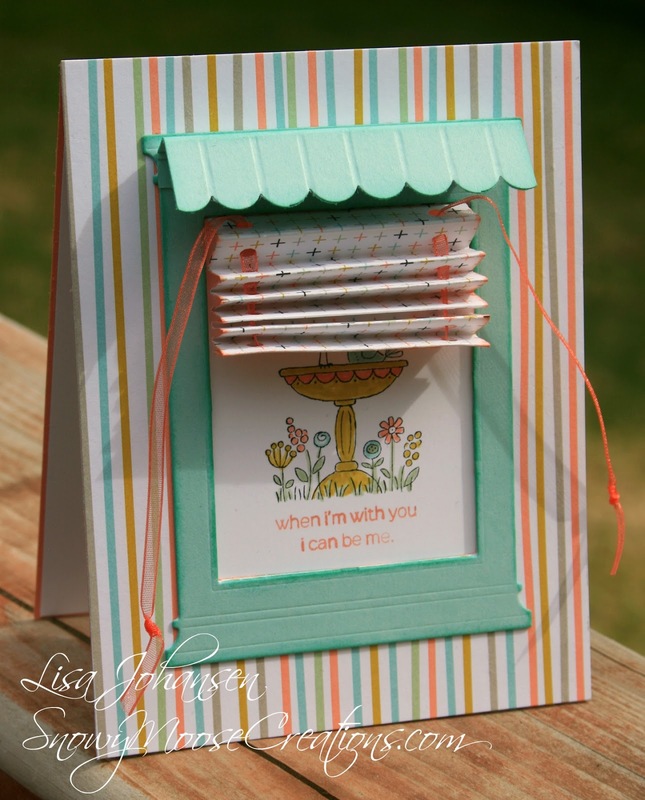 She wants to see a project with stripes on it, plus include a removable/movable element. I was a bit stumped on the movable part. I was going to do a bookmark and thought, naw, get a little more out of your comfort zone. So then I thought about a slider card....naw, too much work involved LOL. 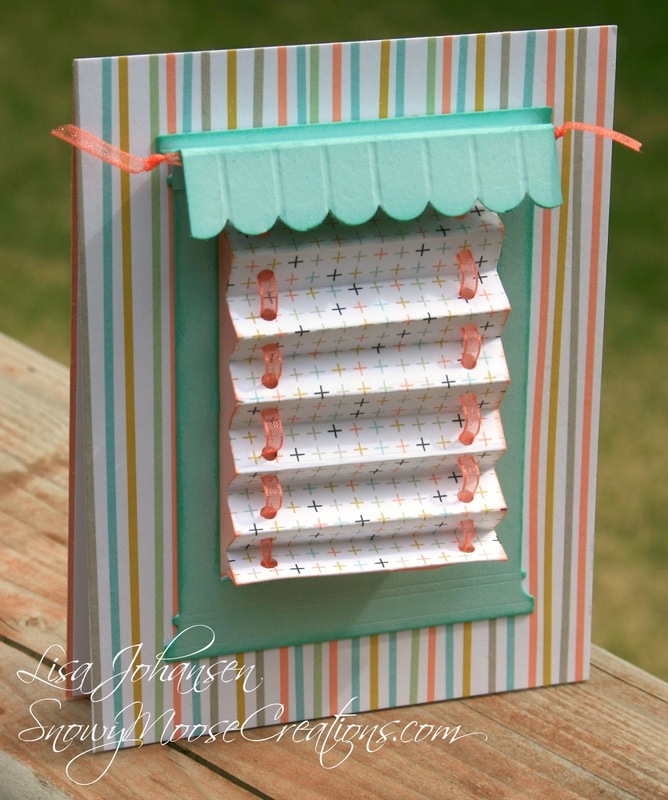 After perusing the net I finally decided on a mini blinds card! I didn't have any rectangle dies so cutting out the middle part was the toughest part. I used the Grand Madison Window die to decorate around the hole and for the image inside I stamped an image from For The Birds. I forgot to take a picture but the sentiment inside the card reads "you make me happy" from the Happy Watercolor set. Most of the mini blinds cards I found didn't open like a traditional card but I wanted to keep mine like that, with a sentiment inside. I hope you'll come by The Friday Mashup to check out all the great projects from the rest of the DT and then play along with us, we'd love to see what you do! I am stunned with this project! this is absolutely cool and love it! Would love a tutorial from you. Lisa, definitely out of the comfort zone...super, unbelievably awesome! I can't take my eyes off of it. I love the image inside the window, too- just perfect! 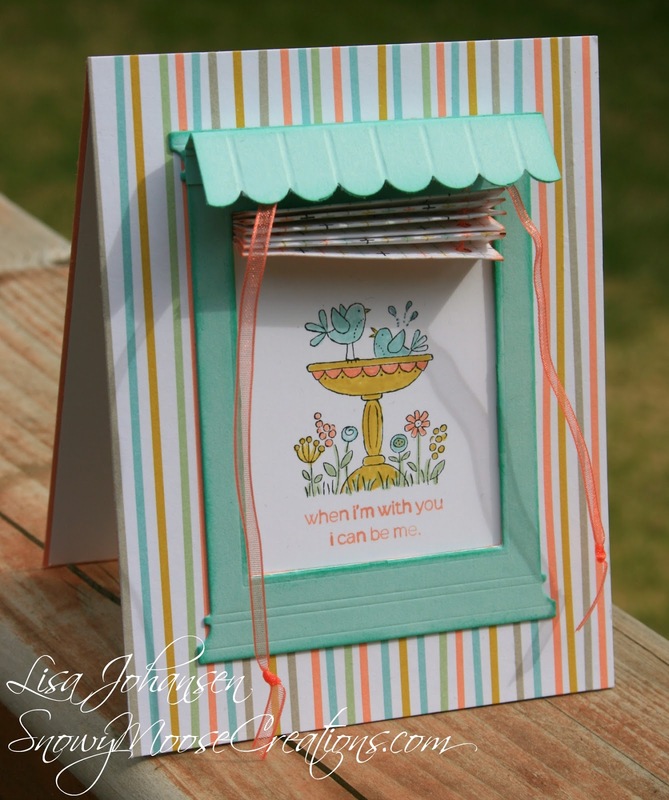 Lisa, this is the most stinkin' cute card EVER!! How creative!! Love it!! WOW! This is just too cute! The image inside the window is so darn adorable. I just love looking at it and if I had the card in my hands I know I would also be opening and shutting the blind. LOL! Great job, Lisa. Yes! I'm sure a tutorial would save us all from wasting ALOT of paper! What is the chance of you doing one for us? I'm sure it would be greatly appreciated by many. This is absolutely wonderful, Lisa!! I was just in awe when I saw it - super sweet design, colours and I just adore that stamp set. One amazing card! I love this card. So original. I too would love a tutorial. This card is absolutely adorable. A tutorial would be fabulous so I could make one to sent to my daughter who is away at college. This card is so cute! I've never seen a card like this before. Do you share your tutorial? Love it!